What can I say ... Agatha Christie is my favorite. I've read ALL of her published writings. More than once. Some in Dutch as well. A must-read for Agatha Christie fans. A lot of historical data that is fun to learn. At times, the author gets a bit too heavy-handed about non-PC references in her books. Seriously? It's a bit distracting, but if you can put his snarkiness aside, it is a good read. Fortunately, the snark is few and far between. This well-researched book went into a bit too much detail for my taste. However, I could recommend it for someone wanting to know a great deal about Christie's character development and storylines. If I had read every single piece of work she'd written, I would no doubt find the analytic style more appealing and I would understand all the little references made to her numerous works. Fantastic read for those interested in a bit of background on the inspiration and history behind each of Christie's works. My only bone to pick is that the sources and references are not well documented and it rather tough to look up the original sources of many of the quotes attributed to Christie or her husband. Agatha Christie disappeared soon after she found out her husband was having an affair. She staged her disappearance well . . . I liked this book, but I have a hard time getting into non-fiction. A good read, though. Well written. I didn't actually finish it. An interesting examination of the works of Agatha Christie--book by book--reflected through the lens of her personal life. The author carefully refrains from revealing "whodunnit" and succeeds in whetting one's appetite to read (or re-read, as the case may be) the master's works. Talks about her works more than some others, which is what I need. But I think I can find better sources. 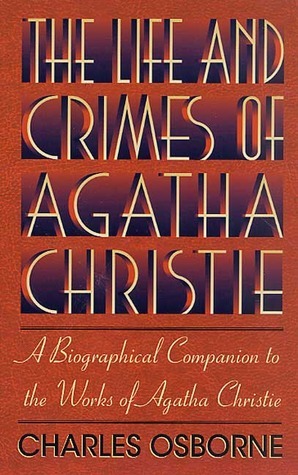 Not the best biography of Agatha Christie out there but it does include a better-than-average discussion of her work. Bit too picky for me. Do I care she left an 'e' out of a French word? Overload of tedious information like who acted in her first films in 1930 etc. I will stick to just enjoying rereading her books. Despite the fun title, this one is a bit boring and dry. Osborne spends a lot of time on her plays. Like many biographies, it sacrifices insight to detail.